As I mentioned in a previous post, I was really ecstatic about the implementation of the Bay Area Bike Share (BABS) and I think it is a sign that bicycles are less marginalized in SF than previously. 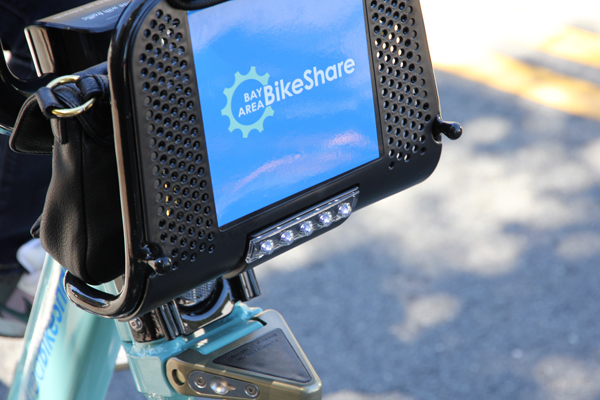 Having the bike shares lends great legitimacy to the whole bicycle movement. It’s not just obligatory bike lanes going down. 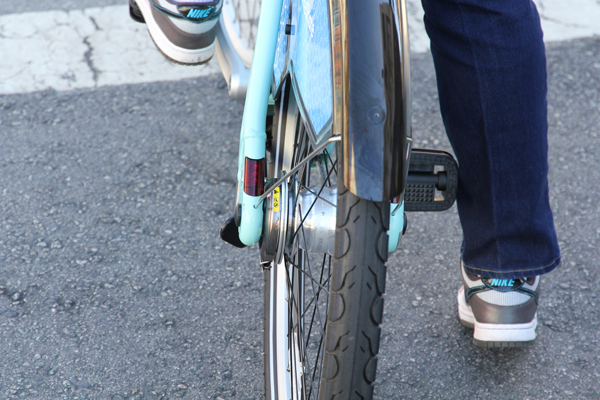 Now, the city is backing and putting actual bikes on the road. Just riding this bike around town branded with its official Bay Area Bike Share logos, I feel that I get more respect from motorists. Now if these anti-cyclists get angry at us like they often do, while riding these bike shares they would be putting the blame on the city too. We’re no longer fringe outcasts in the mean streets of SF. We are now officially backed by the government, consummated in the coolness of a celeste green color. She’s a beauty! Look at the cushy saddle, perfect for upright bicycling. Right on the day it was launched, Nellie and I couldn’t wait to get on one. We had tried City Bikes in Copenhagen and it was a terrible system, but of course it was implemented in 1995. My workplace has a free bike share system but it is rarely used due to its campus location on hills. So, I was hoping for a better overall system. This is where you insert your credit card to request a bike. It doesn’t take Discover Card. We just wanted to test out the bikes so we got the 24 hours pass. The 24 hours or 3 days pass is inconvenient because you would have to buy it at the kiosk, not online. You would have to first to stick your credit card to purchase, it gives you a 5 digit code on a small piece of paper, and enter it into the keypad on the rack. Then you have five minutes to pull out a bike from the docking station (if you don’t undock your bike within the grace period, repeat the process), then when you want to get a new bike at the next kiosk you would have to do the process all over again. I thought it was annoying. However if you purchase the one year membership of only $88, you just swipe the key fob (which they mailed to you) over the keypad and you get the bike instantly. The green arrows pointing to the kiosks were the ones that we used that day. 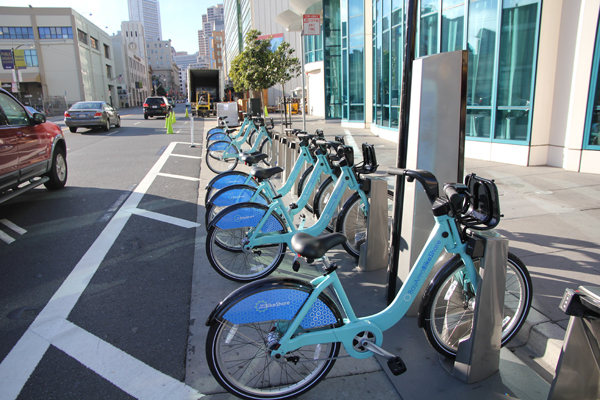 So we set up a test ride around South of Market (SOMA) to get lunch, errands, shopping and dinner in the end. We got the bikes at Townsend and 4th St kiosk across from the the Caltrain station, and rode toward the Embarcadero because that was the safest route to get to Financial District for lunch. It took us 25 minutes to get to the kiosk at Market and Battery St close to Specialty’s, our lunch place. On the way there, we passed 5 other stations! It was a little exhaustive pedaling the 50 lbs (23 kg) clunky bikes for 25 minutes but it was very comfortable. They absorbed shocks very well from cracked pavements and potholes. We felt safe riding them, even without helmets. It’s probably due to a few reasons; the upright position you’re sitting provides a better all around view of the surrounding; the stability of the bike from the weight and fat tires; high visibility from the bright celeste green color; and the bike can’t go that fast. These bikes should fit anyone from 5 ft (1.5 m) to over 6 ft (1.83 m) tall. Moreover, I like that the seat post has markings on it to help adjust the next bike you rent to your specific height quickly. Nellie’s injured foot is 80% better since the Amsterdam trip and biking is her best way to get around town. The nice thing is that we just dock the bikes without having to find a pole (bike racks are rare in the Financial District) to lock them. We walked 2 small blocks to get lunch at Specialty’s. That was a nice one hour lunch and felt pretty relief that we didn’t have to worry about leaving them outside. When we were done, we walked another small 2 blocks to get to another kiosk at Market and Sansome St. We stick our credit cards into the machine to get the 5 digits code again to get the bikes. That is about the only hassle we experienced all day – swiping our credit cards to get the 5 digits code and entering on the keypads. 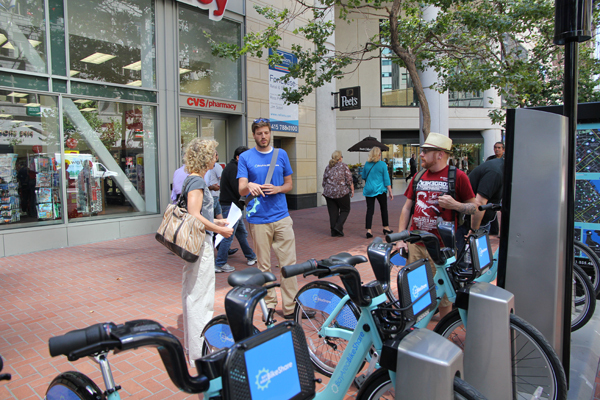 A BABS staff was at Market and 2nd St on the first day of the launch to show how bike shares work. Then we rode for a few blocks to Union Square for shopping. 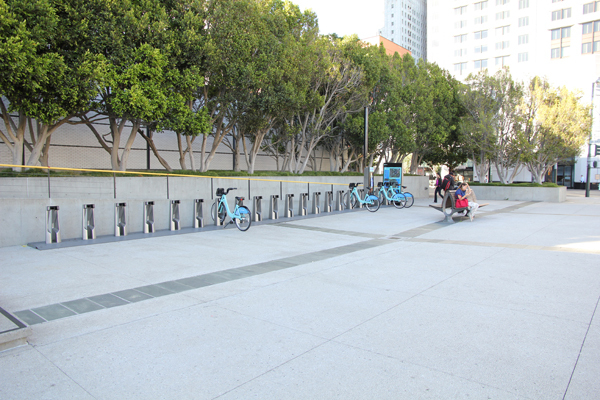 We docked the bikes at Market and 4th St. We usually don’t take our bikes to Union Square because of bad experiences. I have two friends that got their saddles stolen. 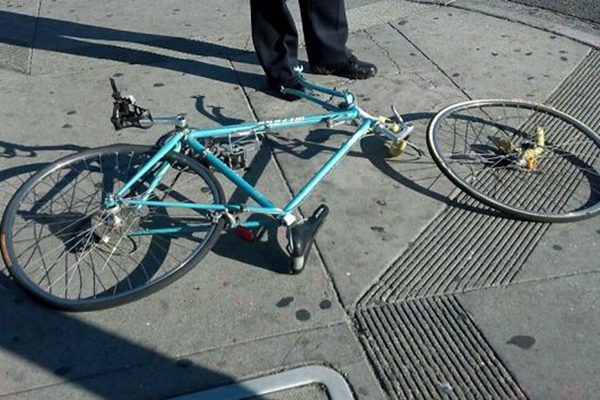 Also in our first few months living in SF our bikes were stolen in the vicinity, albeit we used cable locks. Even though now we have u-locks, but we still don’t want to take any chance. Almost empty at Howard and 3rd kiosk on the first day! After shopping we walked to Howard and 3rd St to get some photos for this blog. We wanted to get some cool looking people and their bikes going home from a long day’s work. Howard St is a one way thoroughfare going from east to west, and it has a high volume of bicycle commuters. Then we rented the bike again to get dinner at Tin’s (our favorite Vietnamese restaurant in the city). It was pretty cool to ride down on Howard St with a bunch of bike commuters. I love it when car space are removed for bike facilities. Tin’s is located on Howard between 5th and 6th and guess what, a BABS kiosk was nearby. Wonderful! Dropped off the bike at Howard and 5th St, and walked half a block. After dinner it got dark, so we returned to the same station, picked up the bikes and rode almost 2 miles (3.2 km) home passing one other bike share station on the way. Every bike is equipped with bright front LED headlights. 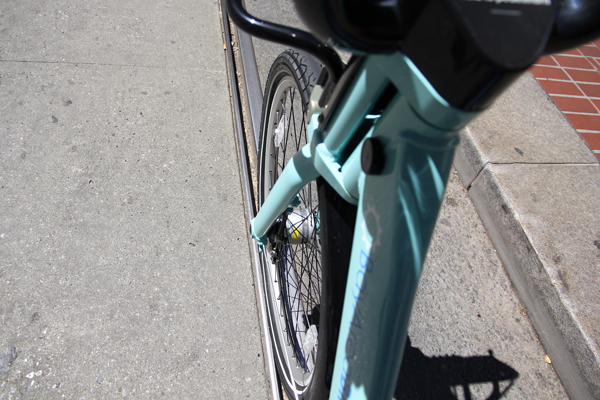 26 in (660 mm) x 1.95 in (50 mm) tires, are comfortable and wide enough to slide over active light rail tracks. 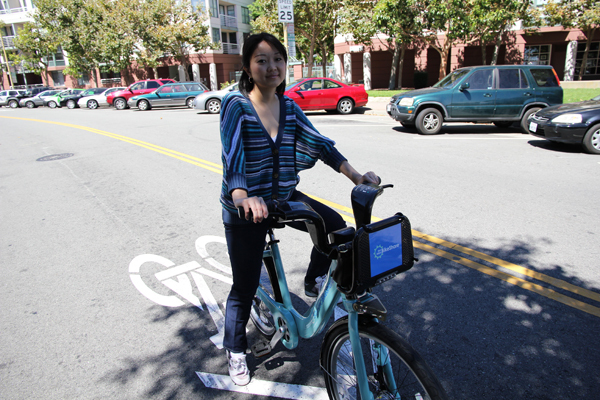 It was such an easy and pleasant experience with the bike shares at our finger tips. 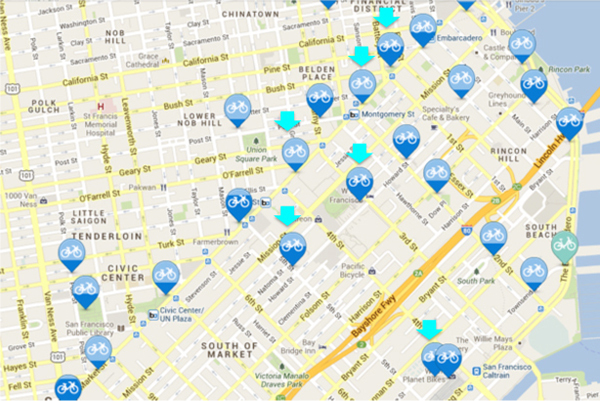 Most bike share stations are located in SOMA (and Market St.) which I think is wonderful. SOMA is such a large neighborhood with some sketchy areas and shops/eateries that are located far apart. Walking could be long and dangerous, so bike shares help in these kind of situations. Moreover, these bikes are available 24/7 any time you need to be transported. You can’t count on taxis and buses during odd hours. Now you may not need to buy a new bike since these bikes are available. It’s almost like you have your own bike but without any maintenance to worry about. Pretty cool, eh! – There must be a way for kids younger than 18 y.o. to use them besides having their parents or guardians be around to borrow them for them. – I find the process of checking out bikes for the short-term 24 hour or 3 day memberships to be inconvenient as I explained above. Since it’s part of the public transit system, I think it would be great to be able to use the Clipper card with it. 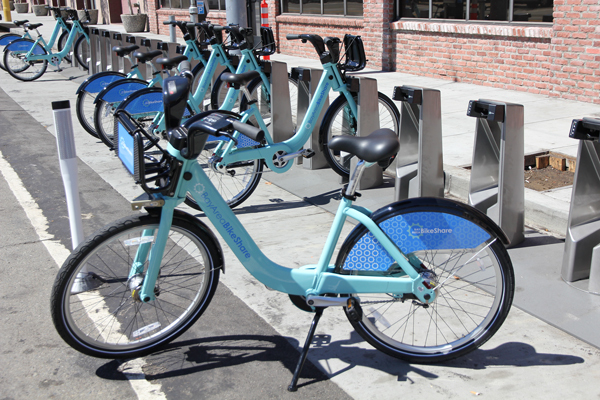 – Why do all bike shares weigh so much? Nellie has a hard time picking up the bike onto the sidewalk. – Having a built-in lock would be a nice addition I think. What if you need to make a quick stop in between stations, like for a quick coffee? Maybe, a cup holder to go with your coffee? – They should put a map near the handlebars visible from the seat of the bike that shows where the locations of the kiosks or a smartphone app to display availability of bikes. – When they expand this next year, hopefully they will put a few stations in other neighborhoods such as the Mission District, Dog Patch, and Mission Bay. 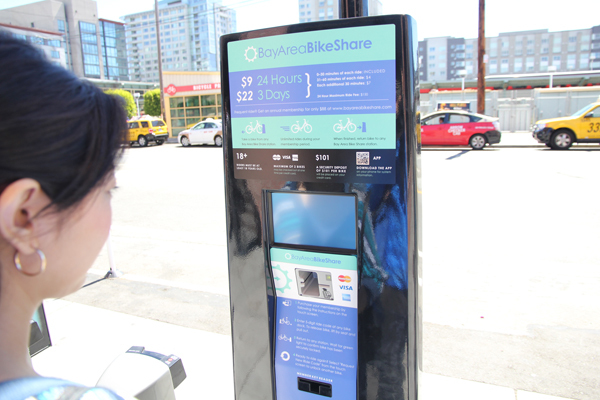 – In addition to SF and the cities on the peninsula having bike share stations, Oakland should have them too! 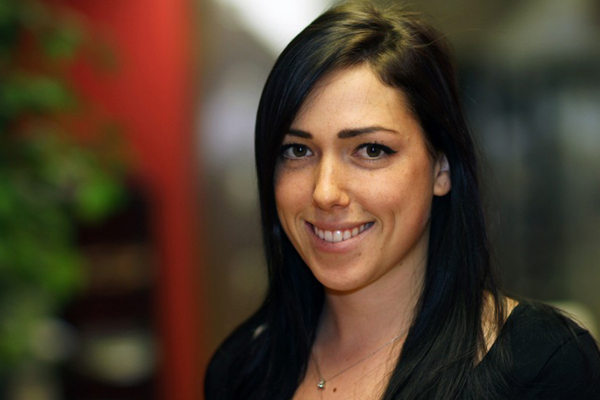 Amelie’s death: last of five tragic deaths involving truck drivers. Amelie Le Moullac, 24. Image courtesy of Voce Communications. What a very sad last week it was for the bicycle community. Amelie Le Moullac of 24, was on her way to work last Wednesday morning. 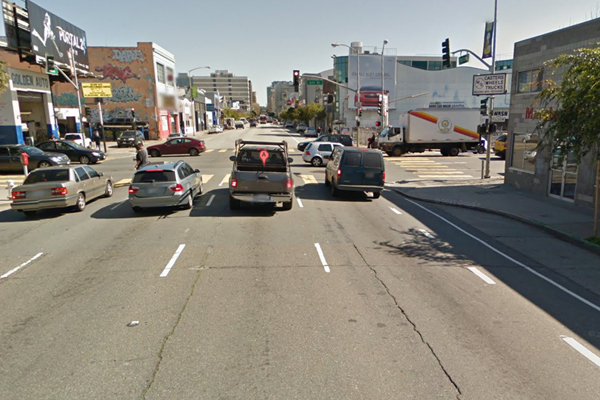 She was riding her bike on a striped bike lane going straight on Folsom St. in the SOMA neighborhood when a truck driver made a right turn on 6th St. and killed her. It was the driver’s fault but of course he wasn’t cited. Amelie’s bike. Image courtesy of SFGate. Since 2011, the last five bicyclists’ deaths had all resulted from colliding with truck drivers at intersections in San Francisco. This seems like a common theme here. This is all too familiar when cycle tracks are not put in. I hear these kinds of stories coming from London as well. 50% of cyclists’s deaths in London involve trucks. The reason I think is that cities like London and San Francisco are very auto-centric and both have a rapidly growing bicycle culture. However, both have dysfunctional bike infrastructure which is composed of striped bike lanes. As a result, cyclists are forced to share roads with motorists. In just about any city with this kind of set-up, tragic fatalities with motorists are bound to happen. Bike lane on the right on Folsom St. Image courtesy of Google Maps. The street Amelie was a riding on is a one way thoroughfare with 4 lanes. This is one of many streets (pretty ridiculous for such a small and dense city) in SF which are very suitable for large trucks to be on. The construction frenzy in the city has also brought in dozens and dozens of these trucks. Add to the fact that truck drivers can’t see you because they sit 8 ft/2.4 m above ground with a huge blind-spot on the driver’s right side. Either reduce speed limits on these kind of roads (and enforce it), ban all right turns on red lights, or put in real bike infrastructure. Bicycle commuters are going to take this route because it is one of 2 routes (from the central neighborhoods) with some sort of bike facility that leads to downtown. It’s unfortunate that we have a long way to go to have safe streets throughout SF for bicyclists. Since our city is not going to implement any of these soon, the responsibility to be safe is on us bicyclists. Below are some tips that may help you to be safe. 1. Always look over your left shoulder moments beforehand when crossing an intersection. 2. Don’t speed through intersections, prepare to stop. 3. Be visible to drivers by being out in front at a junction when waiting for a green light. 4. Listen for loud trucks if you can. I know the city can be very loud a lot of times. 5. Be assertive and take the whole lane if you have to. You have the legal right to. 6. And always pass to the left of a vehicle to avoid a right hook, this is when a car merges suddenly to the right to make a right turn sandwiching the bike rider between the car and the curb. 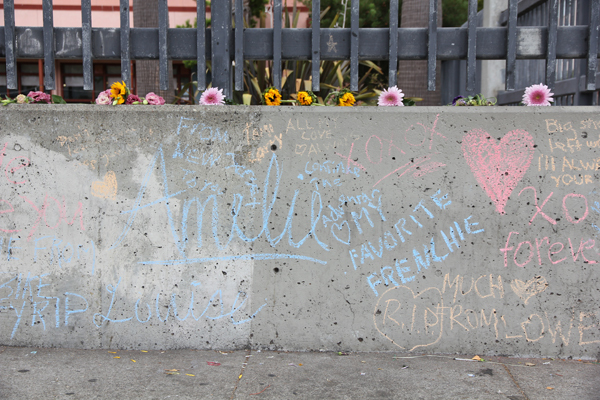 Amelie’s memorial at 6th and Folsom St.